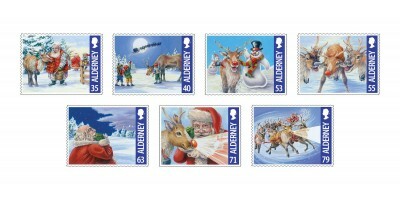 Stamp Description 35p - Santa tending Rudolph40p- An elf comforting a sad Rudolph53p - Rudolph & his snowman friends55p - Rudolph being called names63p - Santa surveying the fog71p - Rudolph's glowin..
Everyone knows that Santa Claus (or Father Christmas to some!) 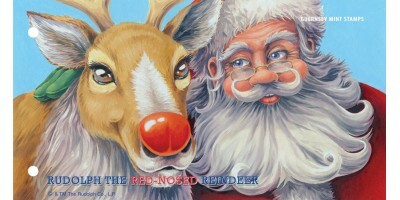 lives at the North Pole, with his many elves and his team of flying reindeer. The busy elves spend the year making toys in Santa's workshop and on the night of Christmas Eve, Santa takes to his sleigh to deliver the presents, to all of the well-behaved children and sometimes coal to the naughty ones! He manages to do this with the help of his elves and his nine reindeer; Dasher, Dancer, Prancer, Vixen, Comet, Cupid, Donner, Blitzen and Rudolph -the most famous reindeer of all. The popular Christmas song 'Rudolph the Red-Nosed Reindeer' tells the story of Rudolph and how his shiny, glowing nose helps lead the way through the foggy night sky on Christmas Eve, ensuring Santa delivers all the children's presents on time. 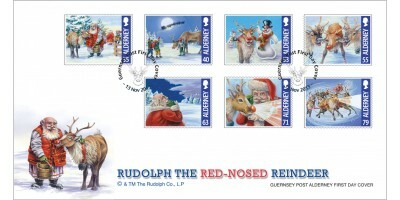 Our Alderney Christmas issue features Rudolph and each beautifully detailed stamp (designed by Nick Watton) tells the tale of the valiant deer with the bright red nose.